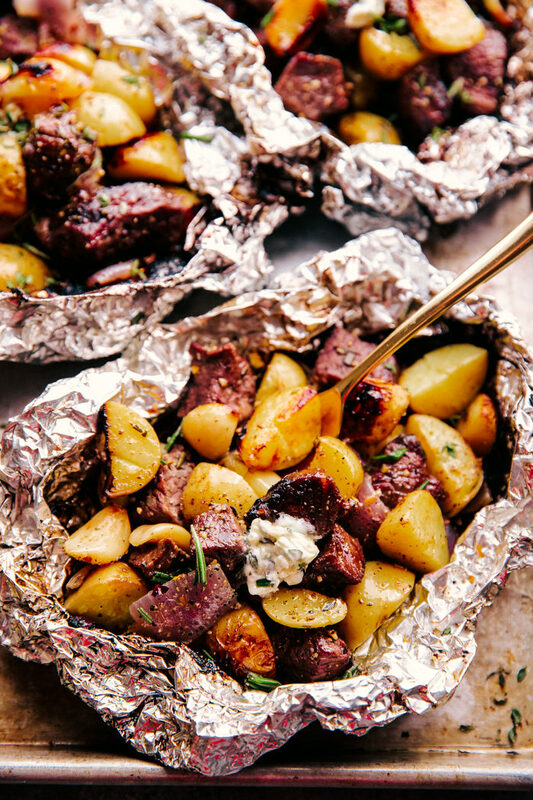 Garlic Butter Steak and Potato Foil Packets are the quintessential family cookout meal that will be loved by all. 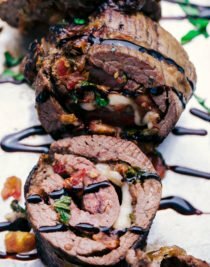 Loaded with juicy pieces of steak, tender baby potatoes, all topped off with flavorful melted herb garlic butter. Don’t stop with this simple and delicious foil packet for your cookouts, you should also try Cheesy Chicken and Potato Foil Packs, Teriyaki Chicken Kabobs, Beef Shish Kabobs, and Bratwurst Dogs, each recipe will perfect for all your warm Summer nights with family and friends. 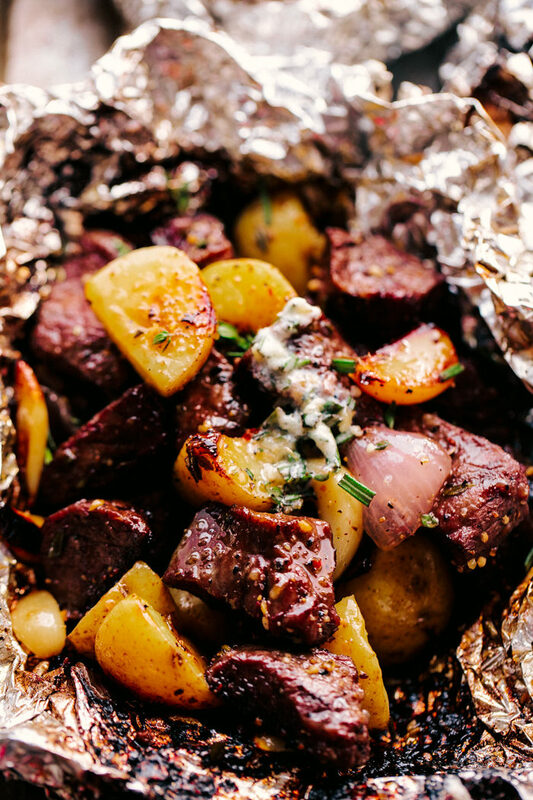 Making life easy, means making dinner simple, delicious and uncomplicated and one way to do that is by making these Garlic Butter Steak and Potato Foil Packets for family and friends. 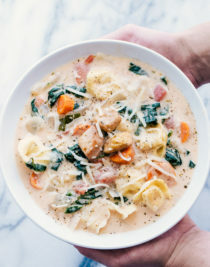 Every time I am making dinner I try and think of how can I make this simple and doable for everyone and I think foil packets really serves up what everyone needs. Making foil packets allows you to cook a large amount of food all at once without compromising on taste or time. One of the big things about cooking for a crowd is trying to time everything to be done at the same time, which is very hard when you only have one oven and multiple things to cook. 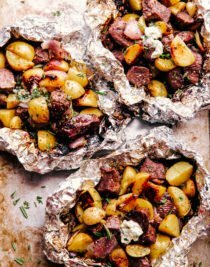 Making these Garlic Butter Steak and Potato Foil Packets allows you to use your BBQ to free up your stove and oven for anything else you may need to cook or bake. 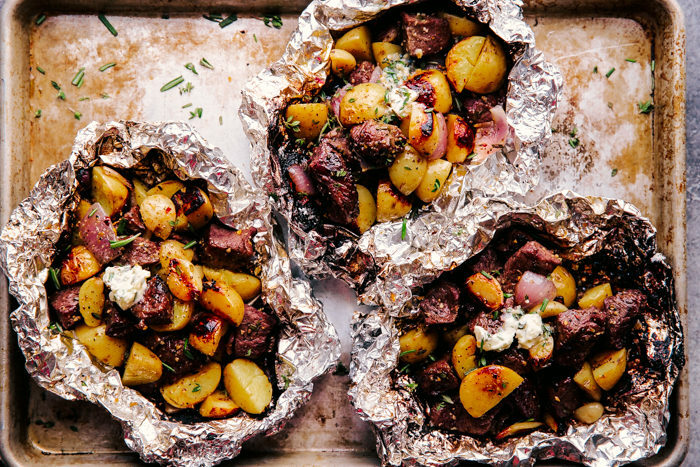 Foil Packets are such a smart way to cook, and these steak and potato foil packets will be just the start you need to delicious foil packet meals. How do you make aluminum foil packets? Using an extra large piece of foil, fold it in half to make it sturdy. Spray the center with nonstick cooking spray and place your ingredients in the center of the foil. Pull up one side of the foil and then the opposite side and fold over the pieces at the top. Roll in the other two side to secure ingredients inside, but don’t seal too tightly so the steam has the capability to expand. Can you cook foil packets in the oven? Yes. You can absolutely cook foil packets in the oven. You can also place them on the BBQ or cook them over a campfire. How do you grill potatoes in foil? 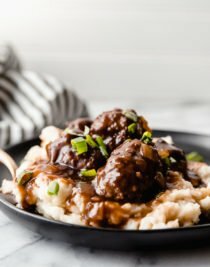 You can cook potatoes in foil a couple of ways. For this Garlic Butter Steak and Potatoes recipe, cut your baby potatoes in half or quarters and boil for 4 minutes. Drain and let cool then add to your foil packet. This way allows you to grill the potatoes and steak at the same time and the potatoes will be tender and cooked through by the time the steak is done. The other way you can grill potatoes in foil is by placing the cut potatoes in foil and sealing them up. With a knife, puncture a few slits in the foil and grill for approximately 1 hour, turning the potatoes often while cooking. How do you make Garlic Butter Steak and Potato Foil Packets? Make foil packets and spray with nonstick cooking spray. Add diced potatoes to boiling water, and cook for 4 minutes. Drain and let cool. Cut steak into 1 inch pieces and place in a large mixing bowl. Add potatoes, onions, whole garlic, and seasonings. Mix to combine all ingredients. Place steak and potato mixture into foil packets and seal. Place on grill and cook for 20 minutes with the lid closed. This will cook the steak to medium rare. If you want the steak cooked more, then increase your grilling time to 25 minutes. Remove foil packets from grill and top with garlic butter herb compound. Close the foil over the steak and potatoes to allow butter to melt and serve. What do you serve with Garlic Butter Steak and Potato Foil Packets? So wether you are cooking for 2 or 10 you can grill up all the steak and potato foil packets you need for a delicious and simple summertime cookout. Make foil packets by folding large pieces of foil in half and spraying with nonstick cooking spray. Place diced potatoes into boiling water and cook for 4 minutes. Drain and let cool. In a large bowl combine steak, potatoes, onion, garlic, thyme, rosemary, olive oil, steak seasoning, garlic salt, and Worcestershire sauce. Mix to coat evenly. Place equal amounts of steak and potato mixture onto prepared foil. Pull up on opposite sides and fold over to seal. Roll up the remaining two sides to seal, but not too tightly. Cook on grill 20 minutes with the lid closed, turning packets halfway through cooking. Remove from grill and let sit 2-3 minutes. Open carefully and place garlic herb butter compound on top. Close packets back up to allow butter to melt and serve. ( if you don’t make the garlic herb butter, baste melted butter over the steak and potatoes and serve).